Fish eyes bobbing in soup bowls is a comedic moment used in many movies. It is intended to be squeamish and funny at the same time. It usually marks an occasion when an urbane and cosseted protagonist is thrown bumbling into an alternative life that for many is real and comparatively harsh; a meeting of two worlds. The eyes confront. As a transitive verb, “eyeing” is to watch or study closely. As I rifle through the puzzle pieces … alone, quiet and safe … it is unsettling to see these faceless unknowns studying me as they are brought, swimming on the currents of my own actions, to the surface. They bob amoungst the pieces. What is it about the eyes that sent shivers? Which alternative life have I been thrown into? The world belongs to those who can look others in the eye while stringing together a grammatical sentence and a cogent argument. They rise to the top of their professions. Others must first deny the visual if they are to find the words. Eyes close and those around are left excluded. Just this week, I turned on a TV documentary and realised how alarming I find a full frontal stare down the camera lens. It can be really rough on the viewer. Newsreaders pull it off, somehow, but this documentary presenter could not hold my attention. The words disappeared, washed away by her relentless stare. But on the other extreme, I get annoyed when people talk to an imaginary person that is, supposedly, standing to one side of the camera. It’s obvious there is no interviewer. Look at me! There is an art to talking to camera. The aim is to appear as if you are engaging in eye contact while avoiding the confrontation of the stare. Perhaps that’s why presenters spend so much time walking, why there is so much bobbing of the head, gesturing (awkwardly). Perhaps that’s why there are so many editing cuts when the presenter is talking to us. It all works to eliminate the stare. How do the newsreaders do it while sitting so still? 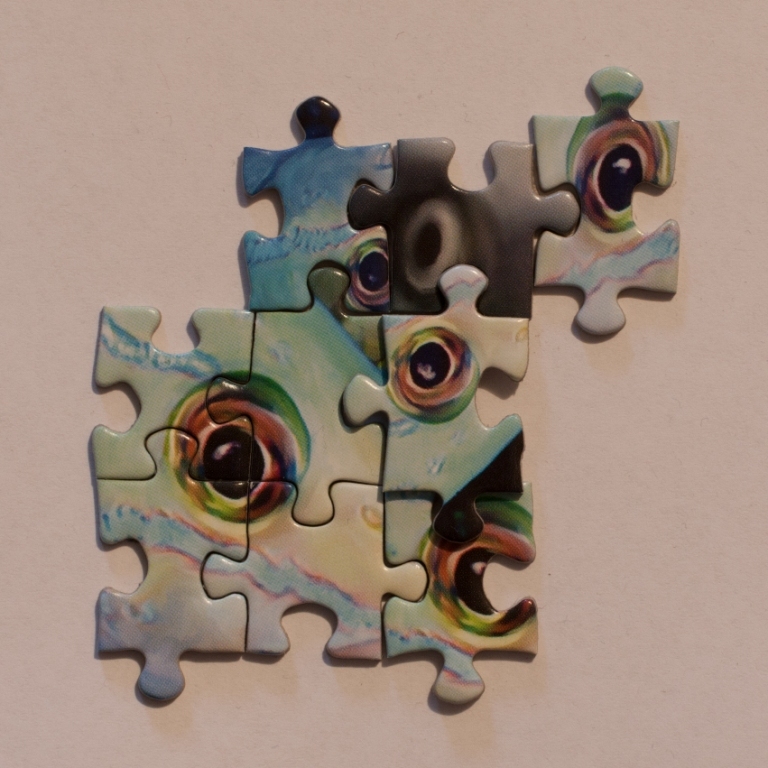 In this photographic series called “Mini Jigsaws”, I select a small number of odd pieces from a puzzle just completed and re-assemble them. The aim is to distil something of the experience thrown up by this particular puzzle. From this scene of brightly-coloured fishes and mencing sharks, the eyes have it. “Reef Sharks by Howard Robinson”, by LPF Ltd, Lafayette, USA.